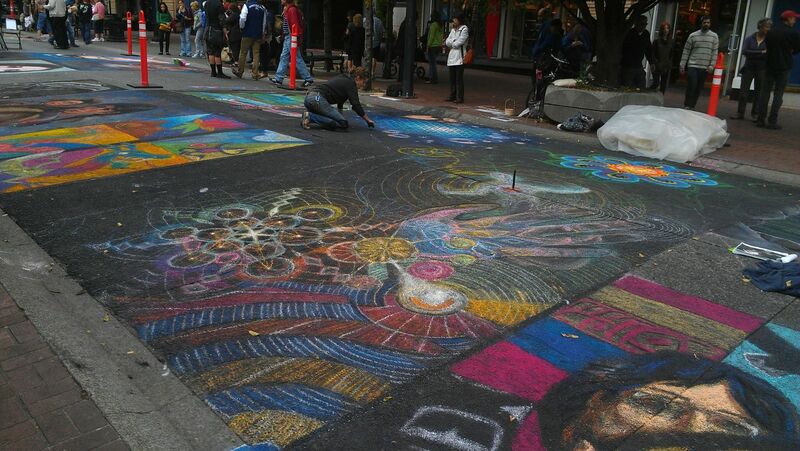 On the weekend of September 14-15 I was involved in the 2nd annual Victoria Chalk Festival. 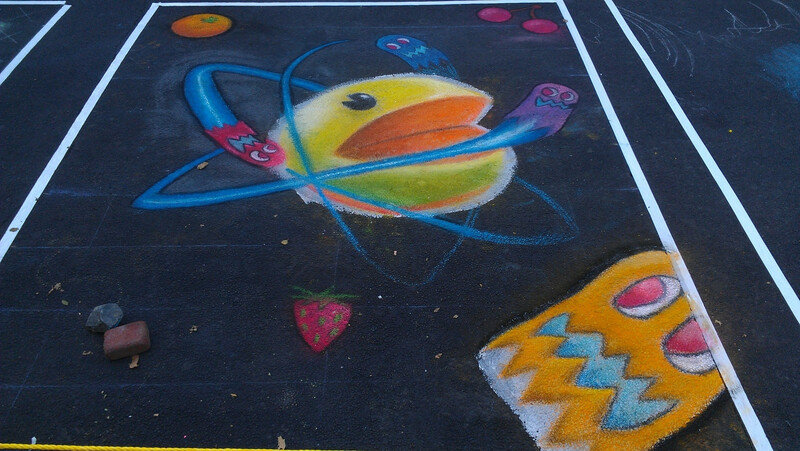 I hadn’t had an opportunity since last year to do more chalk work so this would be my second time doing something like this. I took what I learned last year about the surface quality of the road and what had worked. I had to abandon lots of my detail from my drawing last year so when I went to design this year’s I kept the shapes pretty basic so I could take advantage of the road texture. All images open up bigger in new windows. I printed out copies of the cleaned up linework and colour test version with and without the grids. 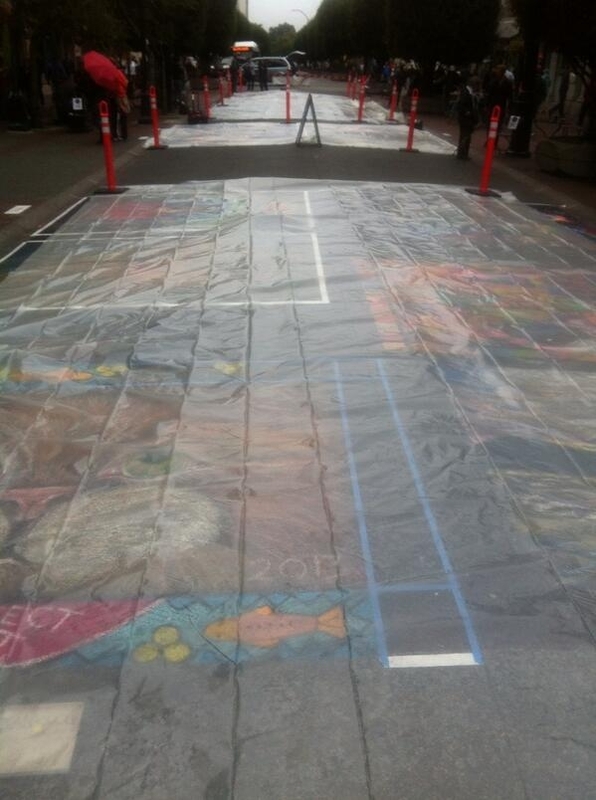 The grids are one technique that you can use to get your picture lined up accurately on the road canvas. Some artists worked free hand or employed other magnifying methods. 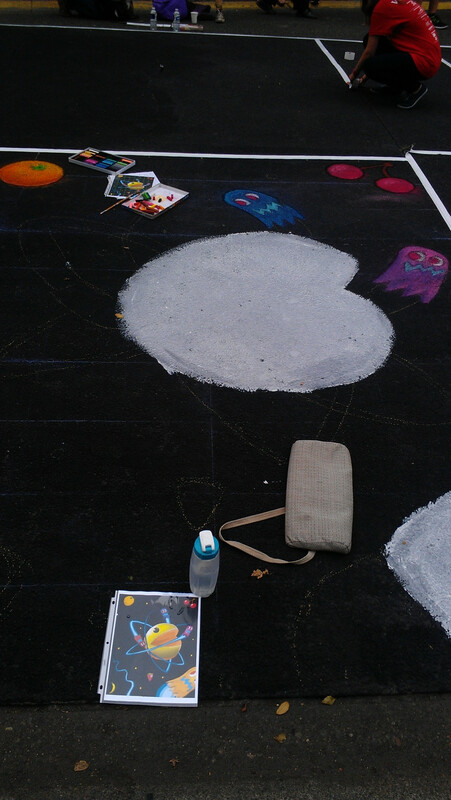 The surface of the road was coated in a black tempura paint that is safe for washing down the drain. I asked at a workshop a couple days before if there was any white tempura since I thought it might be easier to do the very bright PacMan with a light background and it would make the colours glow. The organizers had plenty on hand that they got in case they needed for the Bay Centre piece and weren’t using so they mixed me up a nice batch of it. This is the most physically demanding art I’ve tried! The rain on Sunday set the pace for how much everyone got done and by mid afternoon it was pretty clear that the festival was going to be abruptly shut down. 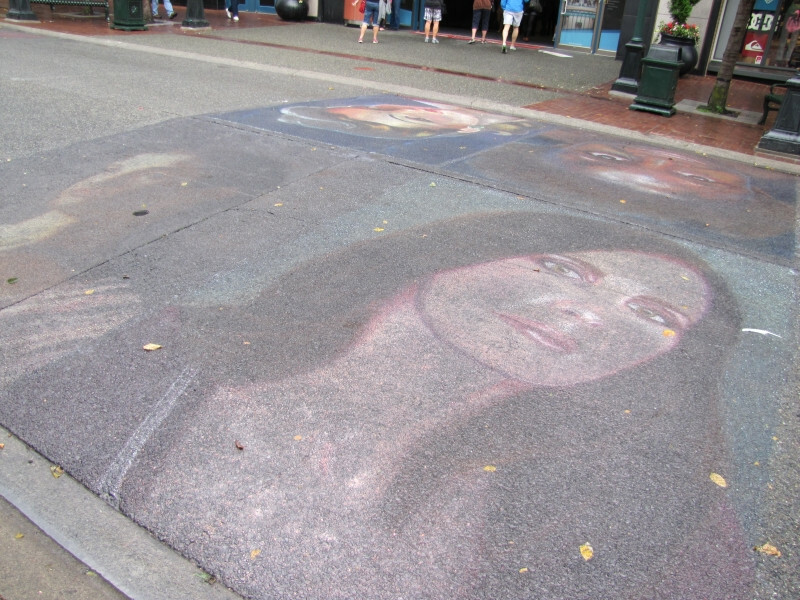 Thunder let us know that a downpour was coming and within 10 minutes over half of the chalk paintings were washed away. I had finished mine around 2 so was able to take some pictures of all the other wonderful pieces. 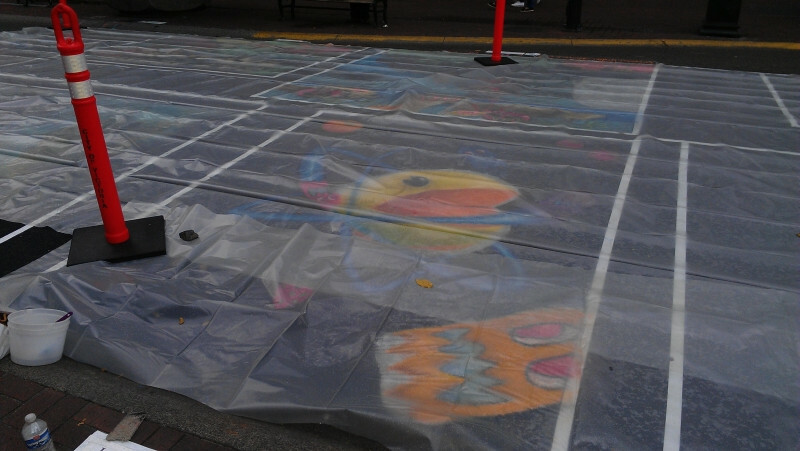 It was great to see all the visiting, local and regional area artists come out to this fest. Kurt Wenner dropped in for a book signing and managed to say hi to him which was a treat, what a nice guy. The volunteers for the event were just amazing, making sure that we all had enough of whatever colour we were working in, that we had water, snacks, coffee whatever. All these creative hippies tore down the tape borders, maybe the Anarchist Book Fair influenced them? I love bees. 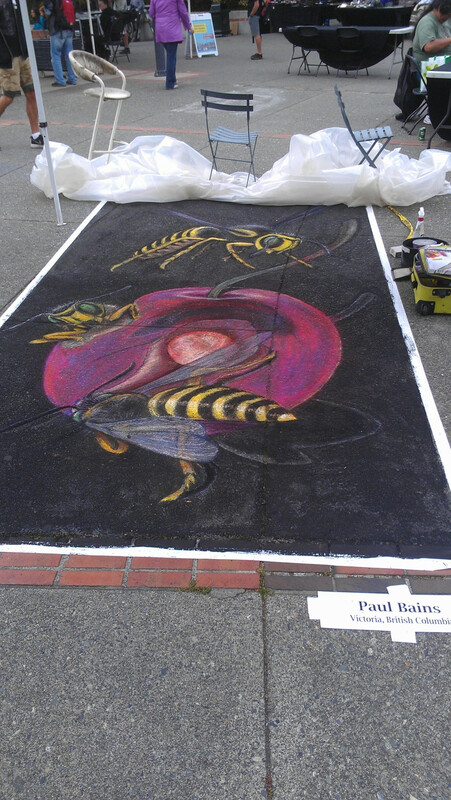 Local artist Paul Bains. 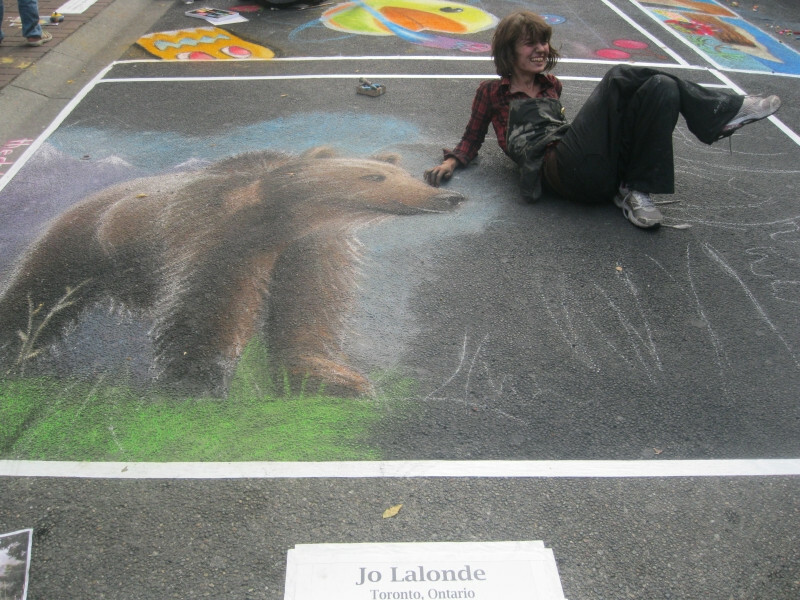 My neighbour for the event Jo LaLonde, the Chalk Chick, posing by her Grizzly. If you made it down this far then you might be interested in some of the process involved in composing my design. I’m a huge PacMan fan and gaming in general. 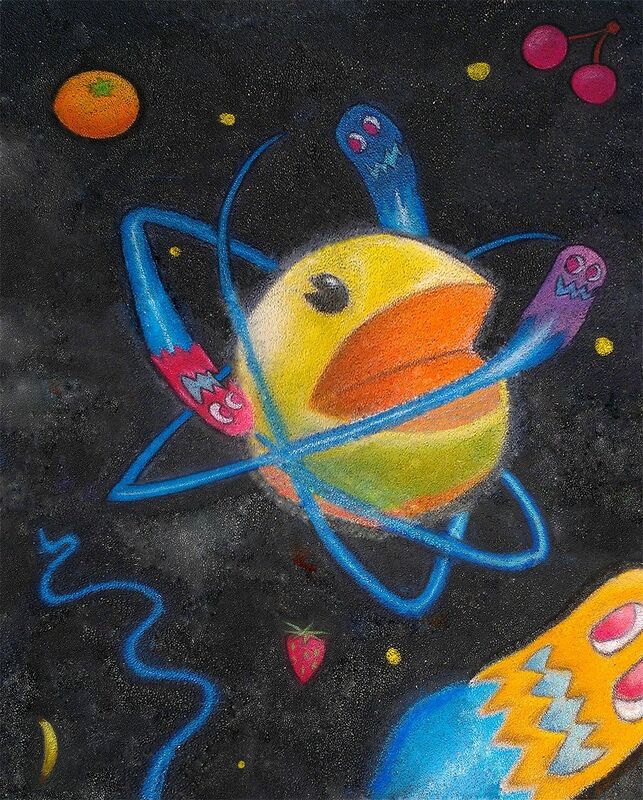 I feel PacMan is one of those ubiquitous icons of our culture and I have a folder on my computer of PacMan inspired art and images. 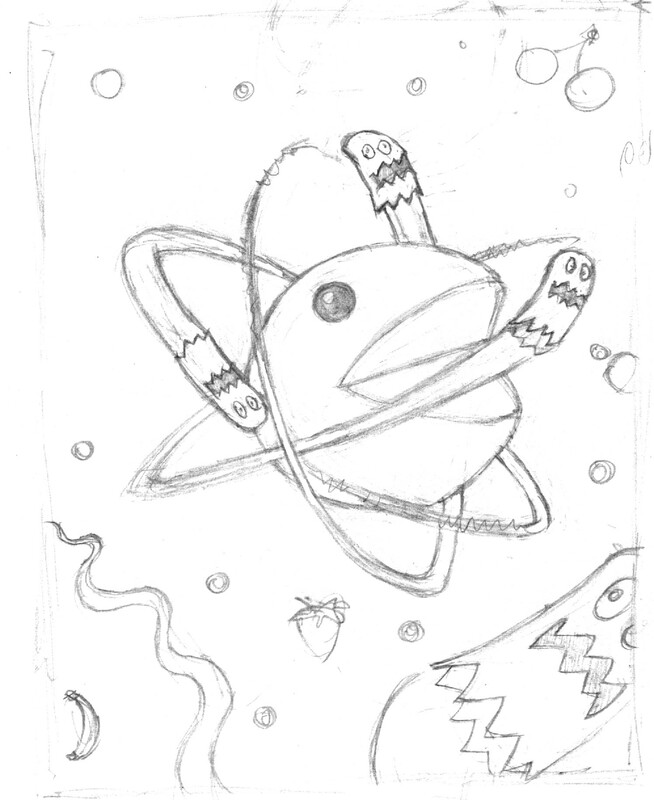 When I was placing the ghosts around PacMan I looked at the original game as my guide for how to colour each one. 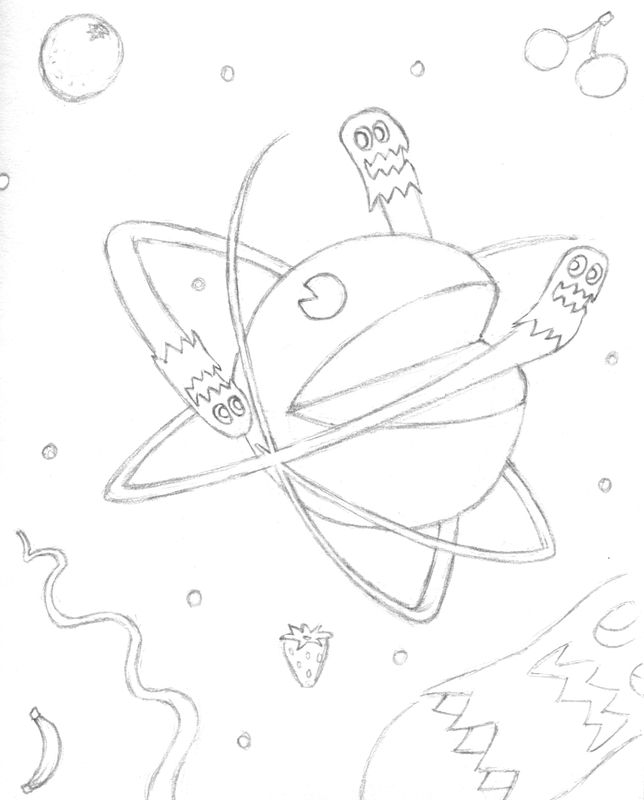 Red/Blinky is an aggressive ghost and directly pursues Pac. Pink/Pinky tries to obstruct Pac by heading him off. 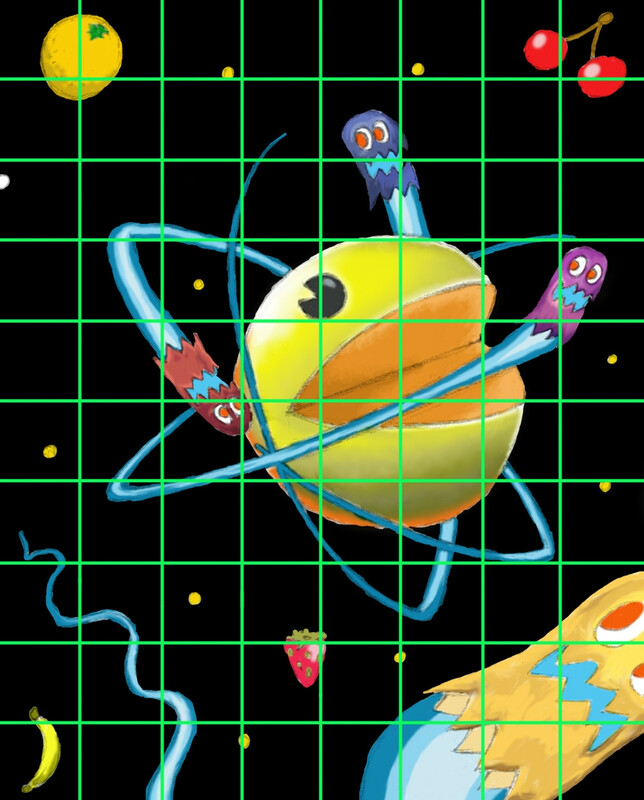 Blue/Inky is a bit odd and uses Blinky and Pac’s position to make a trajectory of where to go. Orange/Clyde is seemingly random but depending on how close Pac is to him he changes his behaviour, toggling from obstructing to retreating to his corner. That informed me how each one of my ghosts were coloured or placed. 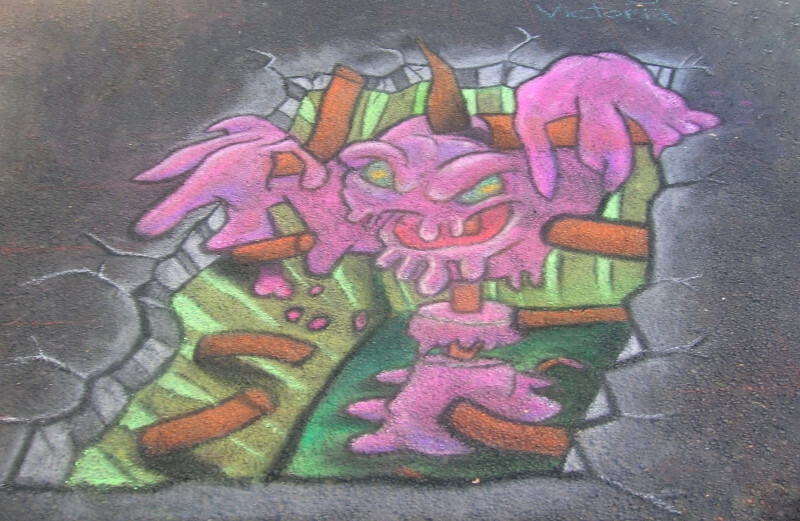 I tried several new techniques throughout this whole event, both with chalk and digitally. 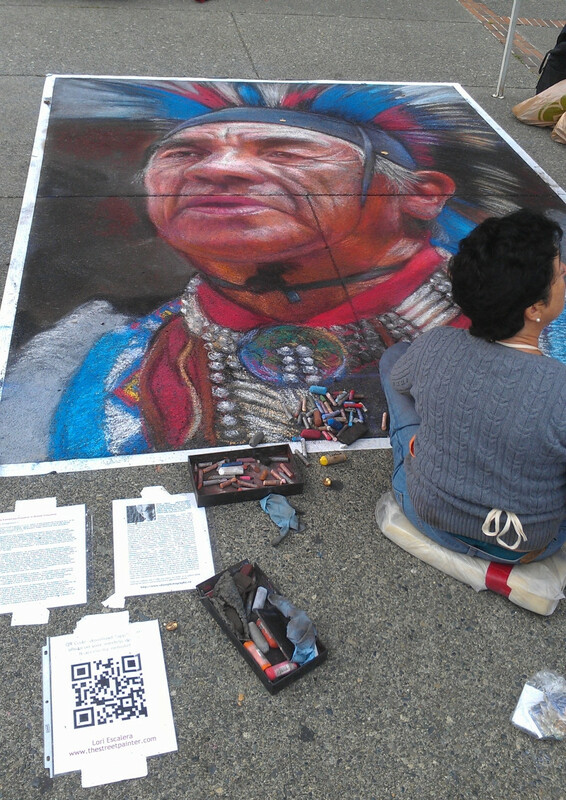 My main tools on the road were a polyester scrubby pad, a paint brush and a rock. 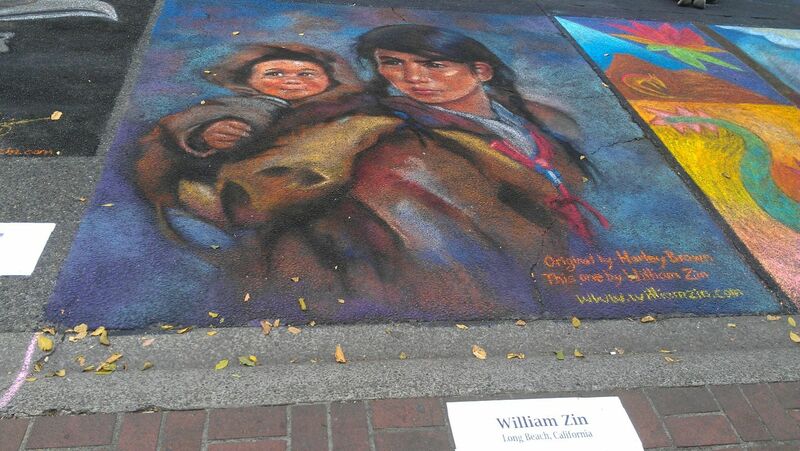 I would put the chalk down, scrub to blend and use the paint brush to finesse the details. 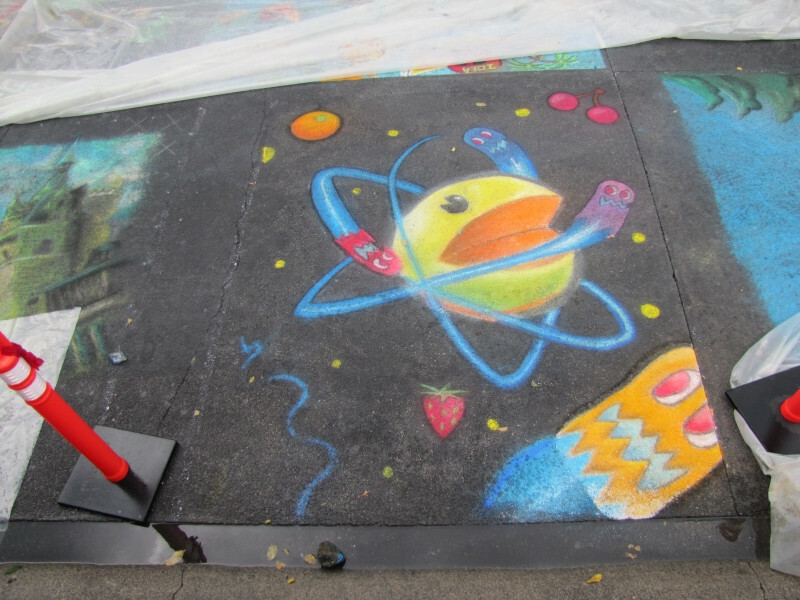 I’d use a rock to crush the small pieces of chalk up, and then I ended up using water and a carpet scrap at the end to good affect, I’d like to try more along those lines in the future. 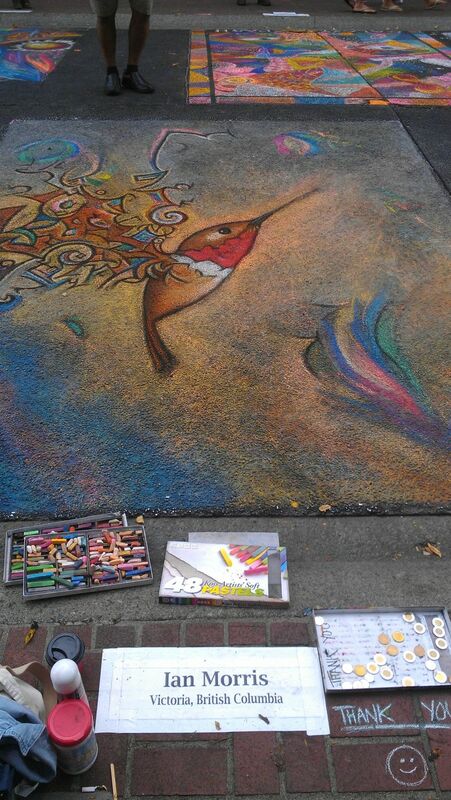 Here’s my finished art, taken in between rain. There was still some rain damage, it ate the banana! I stitched this together on the comptuer, it’s more or less an accurate version of the finished piece. For fun I went back to last year’s piece and edited the road too. I looked into 3d digital applications, but didn’t end up using any of that material, though I am far more up to speed with Blender and a half dozen more programs now. After I was done I did use Photoshop to stretch and resize the image to remove the perspective which was far more tricky than I thought it would be. My first attempt was far out of proportion and my second is not totally accurate but it was a lot of fun experimenting with the new content aware brushes which are essentially algorithm tools. It’s nice having exposure to all of these techniques and will carry them on to future projects. 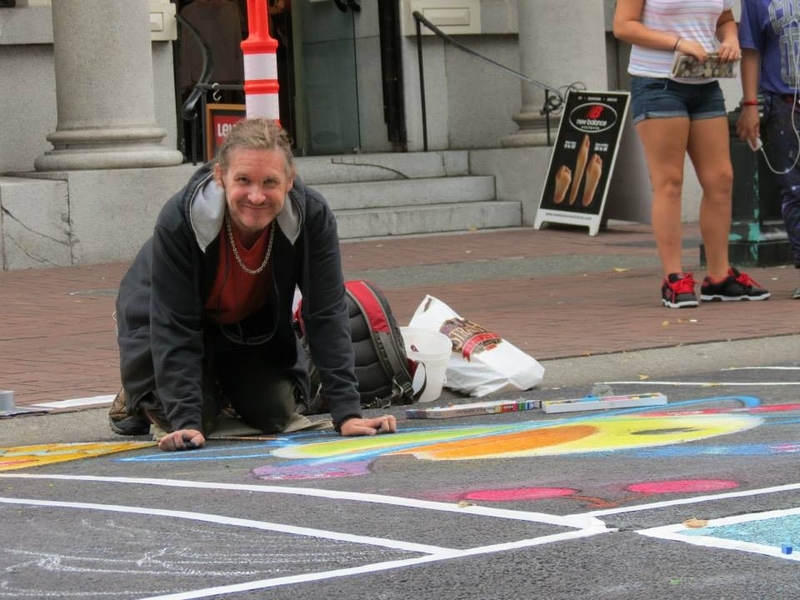 Thanks to John Vickers, the volunteers, City of Victoria, the artists and everyone who came down to see the fun! Like blobfarm's fanpage on facebook!